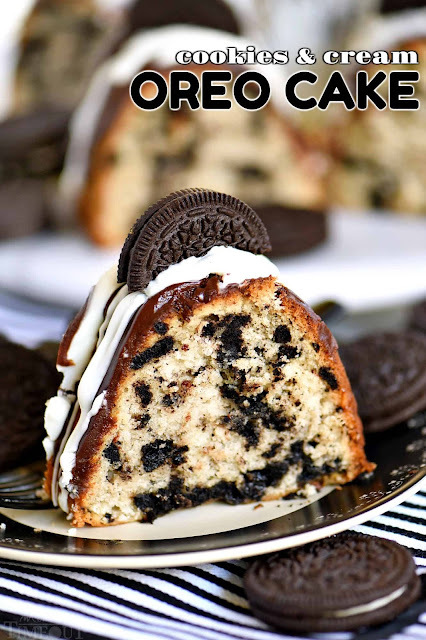 This easy Cookies and Cream OREO Cake is sure to delight the entire family! Extra delicious and wonderfully easy, this showstopper of a cake will be a welcome addition to any gathering! In a large bowl, combine cake mix, pudding mix, vegetable oil, almondmilk, and egg white. Mix on medium speed for 2 minutes until well combined. Stir in crushed Oreos just until incorporated. Spoon batter into prepared bundt pan and baking according to box mix instructions, about 45 to 50 minutes, or until an insert toothpick comes out clean. Let cool in the bundt pan for 30 minutes before inverting onto a cooling rack to cool completely. Combine butter, chocolate chips, and corn syrup in a microwave safe bowl. Heat in the microwave in 30 seconds intervals at 50% power, stirring in between, until nicely melted. Stir in vanilla extract. Drizzle over the top of the cooled cake. Let the chocolate glaze set up for 10 minutes before moving onto the white chocolate glaze. Combine white chocolate chips and coconut oil in a small microwave safe bowl. Heat in the microwave in 30 seconds intervals at 50% power, stirring in between, until nicely melted. Drizzle over the top of the cake. 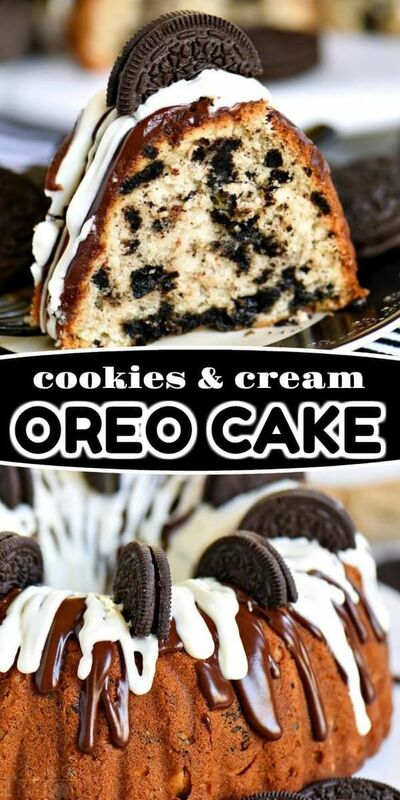 Add additional Oreos to the top of the cake if desired. Let glazes set up completely before slicing and serving. 0 Response to "COOKIES AND CREAM OREO CAKE"